Ayurveda is a profound science with wisdom spanning so wide that it can be difficult to know exactly where to begin. As an Ayurvedic consultant, Susan Weis-Bohlen helps those who are new to Ayurveda address this exact issue. 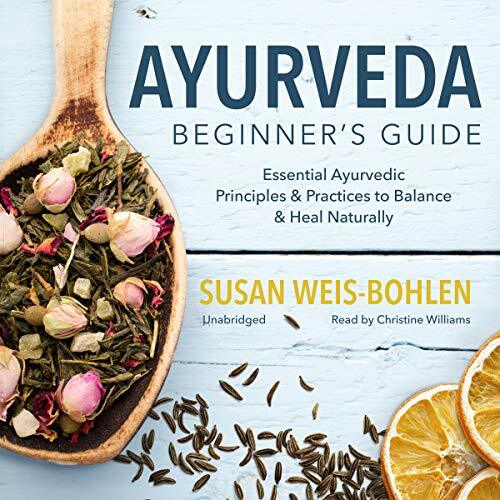 In Ayurveda Beginner's Guide, Susan explains the holistic principles behind Ayurveda, and offers gentle guidance for incorporating its restorative practices in your everyday life. Designed with the newcomer in mind, Ayurveda Beginner's Guide presents a concise overview of Ayurveda that covers its historical roots, concepts, and various healing methods; a three-week Ayurveda plan for beginners to introduce Ayurvedic concepts into one's lifestyle gently and practically; a wide range of Ayurveda techniques such as recipes, yoga, aromatherapy, meditation, seasonal cleanses, and more; and a simple dosha quiz and in-depth descriptions of each dosha. Ayurveda Beginner's Guide will teach you how to unlock the transformative powers of Ayurveda and move forward in your journey toward a healthier state of mind, body, and spirit. ©2018 Susan Weis-Bohlen (P)2018 Blackstone Audio, Inc.